Earn an online master’s degree from an established accredited institution and the first Catholic-Franciscan university in the United States. As a private Catholic-Franciscan university, St. Bonaventure University Online embraces the principles of discovery, community and individual worth. These values translate into six inclusive programs for online master of business administration, online master's in cybersecurity, online master’s of integrated marketing communications, online master’s of strategic leadership, online master’s of science in education school counseling and online master’s of science in education clinical mental health counseling. 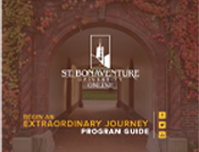 St. Bonaventure is known for its academics as it is ranked #2 in Best Value Schools and #22 in Regional Universities North by the 2019 U.S. News and World Report. In addition, SBU Bonnies are proud members of the Atlantic 10 conference. "McKernan loves “every second” of her job as assistant marketing manager at Godiva Chocolatier, where managing social media is a large part of her workday. Pursuing her master’s degree in Integrated Marketing Communications ignited her interest in social media as brand marketing. “At Godiva I was given the opportunity to run, develop and execute content for their social media platforms,” she said. That’s a lot of responsibility on the shoulders of a 23-year-old, and McKernan thanks St. Bonaventure for helping her meet that challenge. “The background of the whole mission of showing forgiveness and trying to move past (conflict) and work with others is something that I’ve since strived for every day,” she said. "